1893 Arthur Sidey, a 19 year old Welshman ,attempted to preach the gospel on Bell Wharf in Old Leigh. The local publican objected and but for the intervention of local fishermen he would have been thrown into the sea. He was invited to meetings in a house locally, and one evening a couple gave him a shilling and invited him to start a local church. 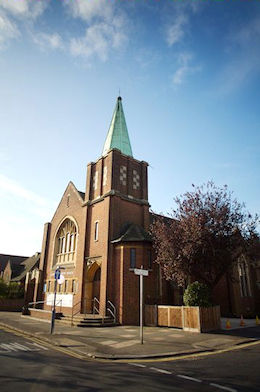 A tin tabernacle was set up in Sea View road. 1899 Rev George Jones was invited to take over the fledgling church. A plot of land was purchased in Leigh Road on the outskirts of the town. A marquee was set up in the field, and that summer saw four young people baptised in the sea. November 1900 A new iron building called the Baptist tabernacle was se t up on the site and in 1902 they were registered with the Baptist Union as Leigh Road Baptist Church. 1905 Pastor William White , who was also a builder, became minister. On a snowy boxing day in 1906 he outlined his vision to the deacons for the future church. They would build a school hall first and then a sanctuary which would hold at least 350 people. By August 1908 the stone laying ceremony for the school hall took place. 1913 Rev Harry Bruce became minister. The church was growing rapidly and new wings were added to the hall to cater for the increasing numbers. 1922 Rev Barlow became minister and the church had grown to over 300 members. It was time to build a new church. It took six years planning and raising funds and finally in 1927 the first stone was laid, and the opening ceremony took place. 14th March 1928 The newchurch was opened. 1936 Rev Pritchard became minister and the church became well known for its Bible Ministry. 1939 Saw the outbreak of the second world war. The minister and many members were evacuated from the area. The church however continued to function as normally as possible and following the war, efforts were made to pick up the pieces although in a changed environment things would never be quite the same again. Between 1953 and 1989 saw the ministries of the Rev C Chilvers, Rev S, Nash, Rev R. West, and Rev G Fewkes all of who had their own roles to play in the development of the church. 1990 Rev Roger Martin became Minister . He wished to see the church develop in a way that would be culturally relevant to the 21st Century. This involved all aspects of church management and church life. A state-of-the art visual and sound system was installed, and a worship team with a small orchestra was formed. 1993 The challenge was to open up the Welcome area and replace the pews with chairs. Planning was in progress when the opportunity arose to purchase the whole island site. This was a cost of £225000. 1995 Saw plans develop for the Alpha project. The old stables area was rebuilt to provide a lounge area with a loft above which would be suitable for youth activities. 1996 The Oasis Coffee House opened on the site. 2000 The Stables centre was opened and Rev Steven Hembery became minister. 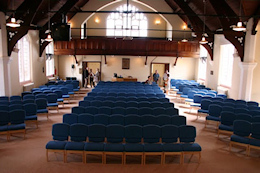 2007 The pews were replaced with comfortable new seating and the Church was redecorated. 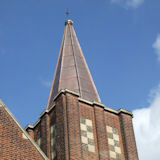 2008-2012 The Build project was started, this aimed to re-model a large number of the church's buildings. The aim of the project was to make the premises user-friendly and multi-functional for membership and the local community. The on-site work begun in May 2011, and was completed in February 2012; the transformed suite of rooms being opened to all on 19th February, and to local dignitaries, former Ministers, old LRBC friends, neighbours and church members, at a celebratory service on the 24th. 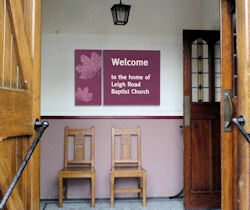 BUILD is about Leigh Road Baptist Church (LRBC) creatively seeking God's will for the surrounding neighbourhood of Leigh-on-Sea. We believe this should be done first and foremost through prayer, scriptural reflection and listening to God. Our desire is to BUILD our faith and trust in Jesus Christ and BUILD on our relationships with each other and people from our neighbourhood. We also hope to BUILD on the resources and facilities that will enhance our individual and corporate ability to meet people's physical, practical and spiritual needs through the Love of God within us.